This scene very nearly gets where it needs to go. 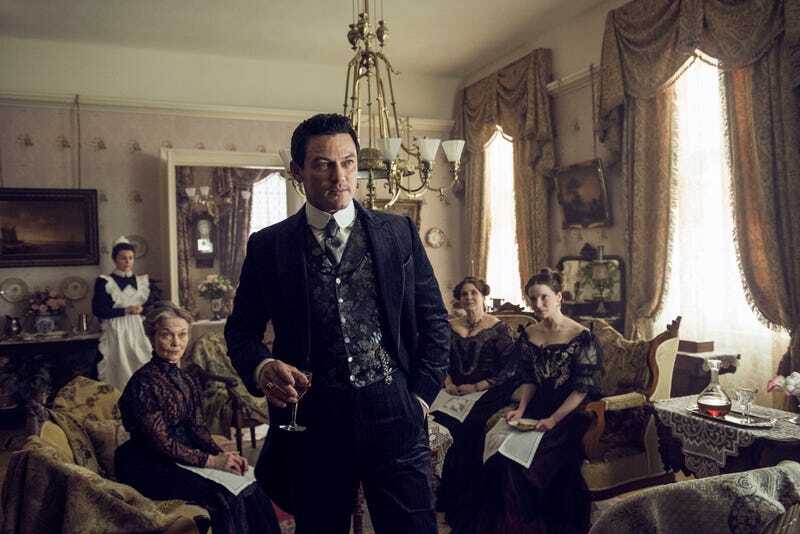 The Alienist is very aware of the aesthetic gulf between rich and poor, and often staggers scenes between them, recreating the whiplash of our well-to-do trio trying to (quite literally) muck their way through this investigation. It lays out some of the things that John Moore will clearly have to unpack later. It’s also aware that John is the one we enjoy the most and like the least, and hanging him out to dry for a minute is fun. It’s a scene from a show that knows what it wants to be doing. In the other scene, Sara Howard attends her Vassar class reunion, which includes a perfectly deployed parlor game in which a ‘murderer’ winks his way around the party to catch and kill the unaware. Casting an eye around the room, Sara sees all her classmates paired up with men. She turns to her old roommate to commiserate; her roommate introduces the man she’s been sitting next to, who’s actually her fiance. We can assume this is a scene meant to parallel John’s social call—singledom regarded as something slightly sinister, the pressure to make small talk when something more weighty is consuming their attention. And the end of the scene, with a few claustrophobic close-ups as the “murderer” winks cheekily at her, is very well done. But the fiance reveal only works if Sara went to her own reunion and sat through this party right through to the parlor-game part without any conversation with her former roommate and friend, which...is odd. She’s been perfectly socially able; is there a difference now? If that’s intentional, it should have more space. As it is, this is a scene in which one of the keenest junior investigators in New York fails to notice an entire person and his relationship to her friend. So this is also a show where not every scene is landing the way they intend. The doctor’s lesser beats are in the service of narrative expedience, which is interesting for a show that clearly wants to dig into the Investigator Getting Too Close to his Investigation thing. Naturally we expect his mild-mannered ways will suffer as the case begins to consume him. And every so often we see a glimpse of that; his frustration as they gather evidence that doesn’t hint at the killer’s psychology is nicely underplayed. But there are moments that feel like he’s interrupted by outside exposition. (“Miss Howard, if she wants to be of aid here, must confront her feelings, because we all in some manner protect ourselves from psychological and emotional pain by taking action to craft fantasies of revenge, of power, of sexual gratification.”) Much of that, and we risk tuning out as they begin to puzzle out the kind of things a procedural-savvy audience takes for granted. When done well, these moments remind us of the surreal experience of practicing psychology and/or homicide investigation at a time when spirit photographs had yet to be decisively debunked. We get some of that this episode, as Sara leads everyone through a fumbling attempt to create a profile without any precedent. But this episode never quite makes the leap in mood that would make this feel weigh—it just doesn’t feel like the victim matters, and shouldn’t it? What we get instead of dread is corpse shots and empty eye sockets—viscera for no narrative payoff, or even a Hannibal aesthetic impact. Sara Howard’s reaction tells us everything we need; the rest is gory icing that suggests either the show doesn’t trust us to understand the horror otherwise, or it’s more interested in the corpse as object than the victim as person to be avenged. That tension between objectifying the victims and sympathizing with them makes for a Ye Olde SVU middle ground in other places, where potentially complex characters like Sally are reduced to Film Noir Mad Libs that seem either empty or tone-deaf. The source material, which was on thin ice about this even when the book was published, has not aged well, and the series needed to give this serious consideration to avoid using victims for pathos points or camp asides. I understand that some of this is just Dead Dove, Do Not Eat: The Motion Picture; there is no getting around the child serial killer with the inevitably troublesome backstory, no matter how carefully the surrounding elements are handled. But it feels as though the show is recognizing opportunities without doing much about them, and that’s hard to reconcile. Clearly, Kriezler still intends to subsume himself in the psychology of the killer, which will either lead to deeper consideration of the victims, or deeper consideration of the killer. Daniel Bruhl is great in the underplayed moments, and his simmering frustration works better as narrative momentum than the body count—in theory, this is going to be a great downward spiral. But understanding and empathizing are two different things. The show is required to do the first; let’s hope it can avoid some pitfalls of the second. “Whatever I’m doing, I’m not butchering children!” I appreciate that the show doesn’t require us to like John Moore, and I understand that this is a call for everyone to Look Within that will have big ramifications later, but it’s hard to refute this particular point. Hiring a lady to relive your cuckolding with you is kind of sad, but it’s barely a ripple on the surface of the Pool of Problems they’re knee-deep in now. I had a veritable Pepe Silvia board of how this show is trying to handle issues of gender and sexuality on an axis of historical context vs. audience empathy. By the time Sally reached “We do things real girls don’t do,” I was stumped. This show does not yet know how to deepen or humanize the exploitative titillation of the source material, and we are maybe just in for a long series on that front. Cyrus (Robert Ray Wisdom)’s big character moment is a solid scene about the immediacy of killing someone that somehow ends with “The thing I remember the most was the feeling of pleasure that it gave me,” as if Kriezler might not otherwise realize that a guy who’s killed at least three times might enjoy it. The aesthetics are coming into their own. The shot of Thomas Byrnes dutifully hiking down that dining table to deliver his bad news again; the slightly tacky circle of red velvet chairs at the Vassar reunion; the Sargent portrait-study lighting amid the upper class; Connor charging through the station picking up followers like iron filings. I’ve been waiting for Q’orianka Kilcher to have things to do, despite knowing she has the Curse of a Supporting Character in a Procedural upon her. And she got to stare longingly, look furiously stung, and polish knives with a smug smile on! A good week for Kilcher-watching. I appreciate that one of the parallels between past and present involves freelancer John still living in his grandmother’s house, flinching whenever someone tries to reach him by phone. Darn centennials. The secret MVPs of this episode were the Awkward Courting Society Youths. “My uncle is a policeman in Poughkeepsie” and “I am terribly frightened of the sea” are both such fantastically delivered bits of small talk. They belong on pillows.